Spanish Singer Buika Awakens From Her Long Night The singer's latest release marks the first time she's been able to produce an album herself. Blending interpretations of jazz classics and Latin American ballads with original compositions, the record mirrors her journey to this new stage in her career. Buika's latest album, her first as both the producer and performer, is titled La Noche Más Larga. 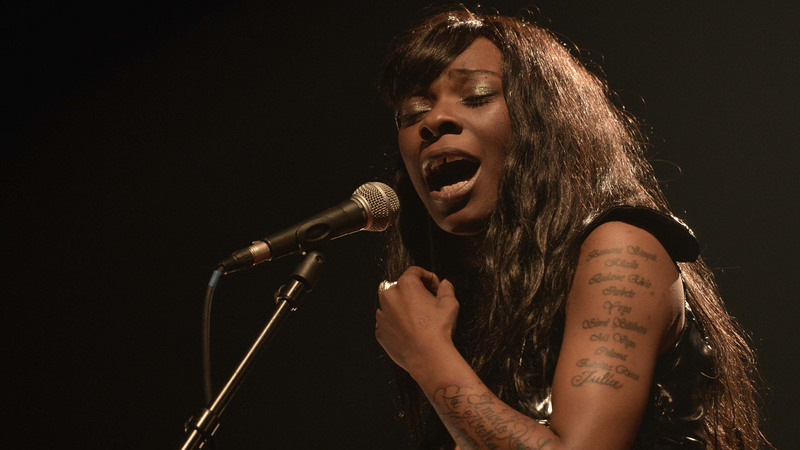 Spanish singer Buika is at a new stage in her career. She just published her second book of poetry and she's currently producing her first film, based on a tale from that book. She also has a new album, La Noche Más Larga — "The Longest Night" -- and it's the first one she's produced herself. The title could be a metaphor for the many years it took her to be able to produce her own record. As Buika says, "I just got out from the longest night of my life." Buika's previous records were all sung in Spanish and focused on popular songs made famous by other singers. On the new album, she does take up the classic Jacques Brel chanson "Ne Me Quitte Pas" in French, and chooses a handful of popular Latin American ballads. She also interprets a couple of jazz songs: Abbey Lincoln's "Throw it Away," sung as an Afro-Cuban ballad, and Billie Holiday's "Don't Explain," sung in the Flamenco idiom. "In a world where one is constantly struggling to balance art with commerce, you see that there's someone who's uncompromising," says songwriter and record producer Desmond Child, who has been working in the music industry for more than 40 years, both in the pop and Latin music scenes. "She doesn't care whether she sells one record or millions of records," Child says. "It doesn't matter to her. All she can do is be herself." Concha Buika was born in Palma de Mallorca, Spain, to parents from Equatorial Guinea — the only black family in a neighborhood of Roma (or gypsies, as they're sometimes called). She became an international star in the Pedro Almodóvar film The Skin I Live In, and she's traveled the world, performing in more than 20 countries. But she says she's never felt at home anywhere. "Because I don't have no identity, to build myself I need information from different countries," she says. "My mission is to go around the world discovering. I'm just discovering myself." But a couple of years ago, Buika decided to leave her home base in Spain and settle in Miami. "I have a son," Buika says. "My son is 13 years old. I want him to live the reality of a place that is made by all the nationalities of the world." Her own songs speak to her personal story. On the track "Los Solos" she sings in Spanish, "The night helped me to see something I want to tell you / That in your company, I feel free / I feel in peace." Desmond Child says the lyrics don't need translating. Hearing Buika's voice is enough to know what she's singing about. "There were a few moments in my life that changed the course of everything — the first time I heard Laura Nyro's music and her raw emotion," Child says. "When I heard Buika, I had that same feeling." Buika says it's taken her a while to get to where she is now, but she's not regretting anything. "It was beautiful; I saw everything," Buika says. "Because in the night there's a really powerful light shining and you can see a lot of things in the night. But I just wake up. I'm happy that I'm here."